The rinks in the area surrounding Sault Ste. Marie are full of action. Regular season schedules got underway in both the Great North Midget Hockey League and the Northern Ontario Jr. Hockey League a couple of weekends ago. And the bright lights of the Ontario Hockey League will shine on the Soo Greyhounds and 19 others teams beginning this week. Let us not forget the little ones, either. The Soo Pee Wee Hockey League has been holding drafts for the various age groups (yes, they even hold a draft process for the six and seven year olds.) And a team such as the Soo Pee Wee AA Minor Jr. Greyhounds has already been to Peterborough for a season-opening tournament. There are, to be sure, story lines out there just waiting to be written. On the Great North side, Sault Ste. Marie was able to retain operation of minor midget and major midget teams for the 2018-2019 season, though it was not easy. The Soo major midgets were in dire straights with a bare minimum of players before the staff led by first-year head coach Alex Cruise and new manager Mike Creedon were able to recruit enough to the point of filling a full roster. Not to dis anyone else — and if you think I am dissing any one, that is your issue, not mine — it is refreshing to feel the positive vibes that have been coming from the Soo major midgets over the past week or so after the negativism of last year. The Soo major midgets may not be a powerhouse this season — they have won only one of four games to begin the 2018-2019 campaign — but it does seem as though they are in good hands with Cruise, Creedon et al. The Soo major midgets do boast some good, young talent that includes rookie goalie Noah Zeppa. (in photo above.) It says here that if given a chance as a free agent by some OHL team, that Zeppa has the capabilities to eventually play in the O. Not being drafted into the OHL does not mean a player has missed out on playing there. Just take the case of another un-drafted Sault Ste. 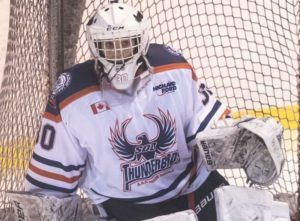 Marie goalie, Mario Culina, who played two seasons with the Windsor Spitfires and won a Memorial Cup before closing out his OHL career in spectacular fashion with the Kitchener Rangers this past spring. In other words, I do believe that even though he is on the smaller side, Zeppa has what it takes to play in the OHL at some point. If he shows the same desire and commitment that Culina did and he gets an opportunity from some OHL team within the next year or so, it will only enhance the prospects of Zeppa — who has a late, 2002 birth date — advancing. On the Soo minor midget side, there are a pair of 2003 birth year defensemen who the OHL scouts are already calling and asking about. They are Jack Matier and Tyler Dunbar. Matier is the son of 1993 Soo Greyhounds Memorial Cup championship defenseman Mark Matier. While his dad was a left-handed shooting defender, young Matier shoots from the right side and is already showing the traits of being an OHL player. This is certainly a kid to watch. And Dunbar, who resides in the Michigan Soo and has dual citizenship, is reportedly on the radar of USA Hockey’s National Team Development Program. The youngster definitely has deep athletic bloodlines. Young Dunbar’s dad, Alan Dunbar, played at the Division 1, National Collegiate Athletic Association hockey level with the University of Illinois-Chicago and his mom, Kris Bullock-Dunbar, is a former Great Lakes Intercollegiate Athletic Conference basketball standout with the Lake Superior State Lakers. At any rate, hockey season is in full stride and in the Sault Ste. Marie area, there is more than enough to see, hear and write about — and that includes down Highway 17 at Blind River, home of the NOJHL Beavers, and across the International Bridge into Michigan, where the Soo Eagles of the NOJHL play. Both the Beavers and Eagles have players from Sault Ste. Marie, Ontario on their roster as well as coaches with a link to the Soo. Justin Mauro, an OHL draft pick of the Erie Otters in 2018, is a rookie forward with Blind River, having played with the Soo minor midgets in 2017-2018. And the Beavers are in the good coaching/management hands of Kyle Brick and Craig MacDonald, a pair of Thessalon boys who have a work and hockey history in Sault Ste. Marie. As for the Michigan-based Eagles, their roster includes three rookie forwards from Sault Ste. Marie, Ontario, namely Caleb Wood, Raf Praysner and Owen Shier. And Eagles strength and conditioning coach Michael Barbeau also resides on the Ontario side of the St. Mary’s River. Story lines, story lines and more story lines. Many of which will also have to do with the OHL and the aforementioned Greyhounds. While the Greyhounds are not expected to be Western Conference contenders in 2018-2019 after missing out on a glorious opportunity win the OHL title in 2017-2018 — they were upset in the championship series by the Hamilton Bulldogs — the Red and White still has some good parts to it, including forward Morgan Frost and goalie Matthew Villalta, among others. Of local interest on the Greyhounds is first-year associate coach Jordan Smith, a Sault Ste. Marie native who got his first taste of coaching in the OHL during the 2018-2019 season with the Sudbury Wolves. Smith is also a former Greyhound defenseman and team captain who learned the game at the OHL level from now-retired coach Craig Hartsburg. Ah yes, those Hamilton Bulldogs, who have their own connection to Sault Ste. Marie with new head coach David Matsos and incoming assistant coach Patrick Jarrett. Matsos was a teammate of the aforementioned Mark Matier on the 1993 Memorial Cup champion Greyhounds. And in being promoted from associate coach in Hamilton to bench boss of the Bulldogs, Matsos gets his second shot at being a head coach in the OHL after an earlier two-and-a-half season stint with the Sudbury Wolves. And as Hockey News North was first to report locally, the 34-year old Jarrett, who hails from Sault Ste. Marie, is getting his first OHL coaching opportunity with his recent hiring by Hamilton as an assistant who will specialize in video breakdown. 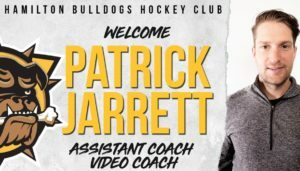 Jarrett is a former OHL centre with the Owen Sound Attack and erstwhile Mississauga IceDogs who went on to play professionally overseas for many years. Thanks for your positive comments on the SMHA Midget programs. You are absolutely right Randy, both programs are in good hands. It’s not even the end of September. Give the players and coaching staff a chance. Everyone in the rink lobbies, behind the glass or in the stands seem to have the right answers. Let the players play, the coaches coach and the managers manage. Also, coaching applications for the AAA programs come out in February if anyone is interested.